Dogs are wonderful companions. This guide has been created to help you make the right decisions for you and your potential new best friend. 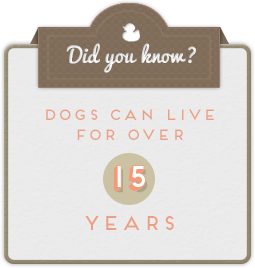 Puppies are adorable but it is important to remember this phase doesn’t last long, and all dogs grow up very quickly. Caring for a puppy generally takes more time and effort than caring for an older dog, so if it is a puppy you are after, be prepared for extra work. If you’re not particularly looking for a puppy, there are plenty of great things about getting an older dog. Older dogs may have (at least) basic training and have grown out of those puppy habits, like the teething phase when pups chew on everything! Would I like a dog that is already toilet trained? Toilet training a puppy usually means taking them to a toilet area up to 10 times a day (and during the night as well) and rewarding them when they ‘go’ in the right spot. You will also probably find yourself cleaning up after the inevitable accidents during the learning phase. Older dogs often have at least some basic toilet training habits. Would I like a dog that already has some basic obedience skills (e.g., sits for you, can walk well on a lead)? Puppies will need to be taken to puppy classes and taught all of these skills using reward-based training Puppy and dog training school is a very important part of being a responsible pet owner and while some older dogs often have basic training, they will still require some attention and guidance. Would I like a dog that already has basic social skills (e.g., can interact safely and politely with other dogs and people)? The first 3-17 weeks of a puppy’s life are critical for their social and behavioural development. During this time it’s important to make sure they have plenty of positive experiences with a variety of different people, places, sights and sounds, as they will influence your dog’s behaviour throughout the rest of their lives. 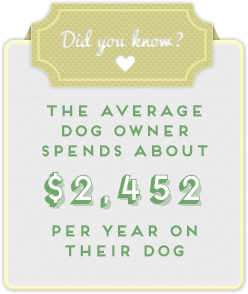 There are many costs involved with dog ownership; they are an expensive addition to any family. All of the upfront costs of getting a dog or puppy like vaccinations, microchipping, registration and desexing? Annual council registration fees, if required in my area? Good quality food for my dog throughout their lifetime? Routine health care (like worming)? Boarding, if I go away? Veterinary treatment in case of emergency or accident? Carefully consider whether your home is suitable for your dog. If I have a yard, is it secure? Are there toys and activities to keep my dog entertained while I’m not home, so it doesn’t get bored, bark or be destructive? If I don’t have a yard, where will my dog be while I’m not home? If it is inside, where will it go to the toilet? Can I get home to let it outside every few hours? Is there safe, outdoor space or a dog park close by that I can regularly take my dog to exercise? If I rent my property, has my landlord given me written permission to have a dog and if so, do they have any additional requirements? What will happen if I have to move? Will a dog or puppy fit into my lifestyle? Working hours, a busy social life and taking regular trips away from home are all factors that need to be considered before becoming a dog owner. Dogs thrive on human company and will always depend on you. It is important that your lifestyle is compatible with caring for a dog so you can meet their needs throughout their lifetime. Do I have time each and every day to care for a puppy or a dog? Will I be home in time each day to feed a dog? Do I have time to take my puppy or dog to ‘school’ for training and to practice every day with reward-based training throughout its life? Am I prepared to walk a dog at least once every day, or twice a day for an active type of dog? How often am I at home to keep a dog company? Will I have time to groom a dog or puppy regularly? Who will care for my dog when I’m away, either travelling or if I’m sick or injured? *Do you want to know more about being prepared for getting a puppy or dog? Check out the RSPCA Knowledgebase. Before getting a dog it’s important to consider what is involved in being a responsible owner and to decide whether you’ll be able to meet all your dog’s needs throughout their lifetime. Dogs are wonderful companions but owning one is a long-term commitment, so make sure you are ready. Do I want a puppy or an adult dog? Can I cover all the financial costs of owning a dog, beyond just the purchase price, including food, bedding, toys and veterinary check-ups and treatment including emergencies? Is my home safe, secure and suitable for a dog? Do I have time to train and socialise a dog? Will I be able to provide them with enough company so they don’t get lonely or bored? A dog that doesn’t receive enough attention is unlikely to become a social and well-behaved pet. Do I have time to walk and play with a dog every day? Am I ready to make a 15-year commitment? Your local RSPCA or vet can give you more information about what it takes to raise a polite and well-balanced puppy and care for it throughout its lifetime. If you think you are ready to welcome a new puppy or dog into your life, then it is time to carefully consider what type of dog will suit you. Whether you’re looking for a specific breed or a mixed breed, every dog has their own personality and individual needs. It’s important to think carefully about what type of dog will best suit you and your lifestyle and whether you can provide them with the necessary care. To help get you thinking about what type of dog will fit well with your family ask yourself the following. A dog that is already well trained? A dog that needs minimal training? Or a dog that needs me to start with the most basic training? A dog that is good with children? Good with strangers? A quiet, calm dog? Or a more playful, outgoing dog? A dog that can already be walked easily on a lead? Or a dog that needs me to teach it how to walk on a lead? A small, medium or large-sized dog? A dog with high, moderate or low grooming requirements? Terrier or Terrier Cross: e.g. 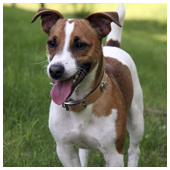 Jack Russell Terriers, Fox Terriers, Australian Terriers, Cairn Terriers, Staffordshire Bull Terriers (Staffies). Terrier-type dogs were originally bred for chasing rats and mice on farms, so they love to chase, dig and bark. They are often fearless towards other dogs and need lots of stimulation and exercise. They can be skilled escapers who can squeeze through small gaps. Staffie-type dogs tend to be less independent than other terriers and often don’t cope alone. Working Dogs: e.g. 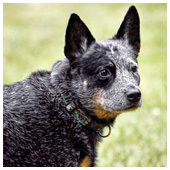 Heelers, Kelpies, Border Collies, Coolies. Originally bred to work with sheep and cattle, working dogs love to round things up (sometimes children!). They are intelligent and easy to train but they need lots of physical exercise and mental stimulation. These dogs are not generally suited to a suburban backyard lifestyle. 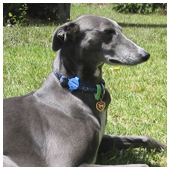 Originally bred for racing, these dog types are very fast and like short bursts of exercise. They have a thin coat and skin making it difficult for them to regulate their body temperature, which means they need warmth in the cooler weather. They love to be with people and will be couch potatoes if given the chance. If you are planning to adopt or have already adopted a greyhound, we recommend downloading our Greyhound Adoption Booklet. Toy/lapdogs: e.g. Shitzus, Chihuahuas, Papillions, Pomeranians, Poodles, Maltese, Silky Terriers. These are small, light dogs specifically bred for companionship, so they like to be with people most of the time. They are best suited as an indoor (on your lap) dog and may become anxious and bark if left outside alone. Many of these breeds have high maintenance grooming requirements. Guarding Breeds: e.g. Rottweilers, Doberman, German Shepherds, Mastiffs, Ridgebacks. Originally bred to guard and protect, this type of dog will feel it is their full-time job to do this for their family and home. They can be intimidating in this role, but they are intelligent and if well-trained they make great pets. These breeds tend to be big, strong dogs so they need physically strong owners, and (did we mention?) training. Gun Dogs: e.g. Labradors, Pointers, Golden Retrievers, Spaniels. Originally bred to retrieve game, gun dogs tend to be enthusiastic, eager to please and friendly with most people and other dogs. 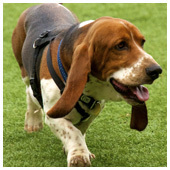 They are fairly easily trained but they do need lots of exercise and depending on their size can be quite strong. Utility Dogs: e.g. 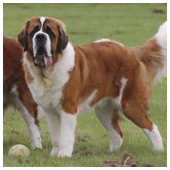 Saint Bernards, Newfoundlands. Originally bred as rescue dogs, this type of dog is large, strong, shaggy and easily trained. They don’t need a huge amount of sustained exercise but do need room to run. Prepare for lots of slobber and lots of grooming. Sled Dogs: e.g. 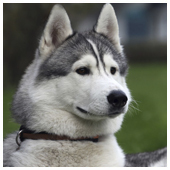 Huskies, Alaskan Malamutes, Samoyeds. Originally bred to pull sleds in the snow these dogs have very thick coats (needing lots of grooming) and don’t cope well in the heat. They are independent and headstrong, with a high prey drive so are not particularly social with other animals and may try to dominate over children. They are athletic, needing lots of on-lead exercise. Although they don’t bark they are howlers. Originally bred for hunting and tracking, containing these dogs can be difficult as they are good escape artists, always follow their nose and like to get into people’s bins. They are usually very social with other dogs and people. Inbreeding (also referred to as linebreeding) means mating animals that have one or more relatives in common. Unfortunately inbreeding is often deliberately practiced as part of pedigree dog breeding usually in an attempt to breed for a particular ‘look’. It is scientifically proven that inbreeding increases the incidence of inherited disorders and can affect how well a dog’s immune system functions. As the level of inbreeding or linebreeding increases, the risks to the puppies’ health and welfare increase. To reduce the risk of inherited problems it’s important to avoid breeding closely related animals. If you’re buying a puppy or dog, you should check their family history to make sure there are no close relative matings, such as father-daughter or grandfather-granddaughter matings. This is a particular concern if your dog is a purebred or pedigree dog. This family tree shows how health problems are increased by inbreeding. 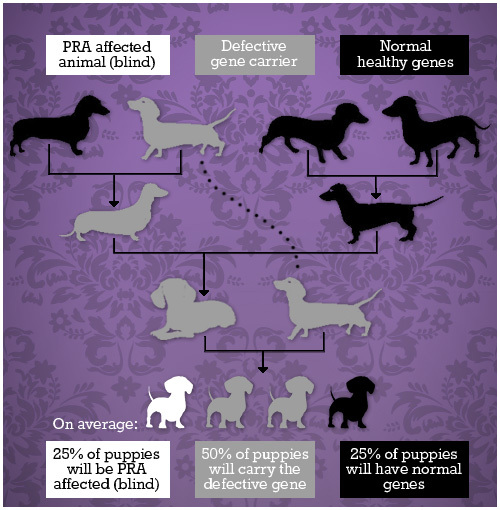 By breeding a dog carrying the defective gene with their grandchild, a quarter of all puppies they produce will be blind. This example shows how a recessively inherited disorder such as PRA, which causes blindness, occurs when a Grandfather dog called Champ is mated to his own Granddaughter. Champ carries a defective gene (d). Because Champ and his granddaughter are related and share common ancestors, she also carries the same defective gene (d). When Champ and his Granddaughter mate, they each pass on a copy of the defective gene, d (that they are each carrying) to the puppies. These two copies of the same defective gene then combine in the puppies (dd), and are expressed as a disease (blindness). In this case, on average, 25% of the puppies born would suffer from blindness and 50% would carry the defective gene (but have normal vision themselves). This type of mating is called ‘linebreeding’ (which is inbreeding) and is commonly practiced as part of pedigree dog breeding programs. Second degree mating like this, is a practice accepted by the Australian National Kennel Council (ANKC) despite the fact that it is scientifically proven that inbreeding increases the incidence of inherited disorders in the puppies and negatively affects their immune systems. Each dog breed is predisposed towards their own list of inherited disorders. These diseases are the result of deliberate inbreeding and selective breeding practices. In some cases these health problems occur early on in a dog’s life, while in other cases problems may not be apparent until the dog gets older. Inherited disorders can affect the heart, brain, kidneys, immune system, blood system and/or the dog’s ability to breathe or walk normally, among many other body systems. Inherited disorders can significantly reduce the quality of a dog’s life, particularly where they cause pain. Unfortunately, in some cases the suffering that results from these inherited disorders is so great, that euthanasia is necessary. 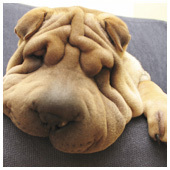 Shar Pei: Familial Shar Pei fever (FSF) is a painful, progressive disease that involves episodes of fever, anorexia, severe joint swelling and severe pain. Dogs may not be able to walk at all during episodes of FSF and some episodes are fatal. Evidence indicates that FSF is a recessively inherited genetic disorder, therefore breeding from close relatives greatly increases the risk of inheriting this disorder. 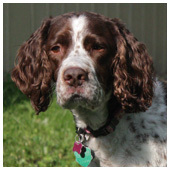 English Springer Spaniel: Fucosidosis is an enzyme deficiency/storage disease. As it is a recessively inherited disorder, breeding from close relatives greatly increases the risk of puppies inheriting this problem. It causes serious neurological problems such as a lack of coordination, tremors, weakness, difficulty eating, difficulty walking, partial blindness, deafness and anxiety. This disease worsens with age and there is currently no treatment available. 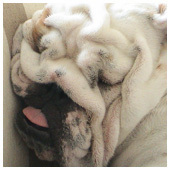 Excessive skin folds/wrinkly skin which cause serious skin and eye problems (for example Shar Pei, Pug, British Bulldog, French Bulldog and Pekingese). The skin between the folds is prone to skin infections and inflammation which is painful and irritating for the dog. Excessive skin folds on the face can also rub onto the eyes and may predispose to entropion – an abnormality where the eyelids roll inwards rubbing onto the eye causing pain. 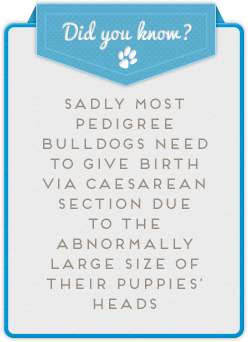 Abnormally large heads which cause serious birthing difficulties (for example British Bulldog, Pug, and Boston Terrier). The puppy’s abnormally large head can be too big for the mother’s narrow pelvis. Abnormally small head (miniaturisation) like that of a Cavalier King Charles Spaniel, which predisposes dogs towards syringomyelia (a painful condition where the dog’s skull is too small for its brain). Any breed with a flat face and/or abnormally small head could potentially be predisposed to this painful condition. Deliberately breeding for a small, ‘cute’ head predisposes dogs to painful health problems. Abnormal body proportions cause serious spinal problems resulting in pain and difficulty walking. Chondrodystrophic breeds (for example the Dachshund, Corgi and Basset Hound) have abnormal cartilage, which causes their disproportionately short legs. This abnormal cartilage can lead to intervertebral disc disease which is a common problem for these breeds. These serious spinal problems frequently lead to paralysis which usually means major surgery or can lead to euthanasia. Deliberately breeding dogs to have a short stature predisposes them to painful health problems. 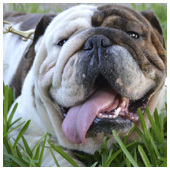 Very flat faces (brachycephalic) cause serious breathing and eye problems. 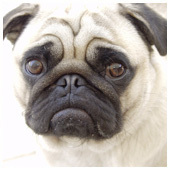 Brachycephalic breeds such as the Pug, British Bulldog, French Bulldogs and Pekingese, suffer because they have a reduced muzzle length, but the amount of soft tissue in their airways is not reduced, resulting in the same amount of tissue being squeezed into a smaller area. This tissue obstructs airflow and causes major welfare problems. They are also prone to several eye conditions that tend to lead to chronic irritation and pain. This is because the flatter the face, the shallower the eye socket and the more prominent the eye. Prominent bulging eyes are at greater risk of injury and sometimes they actually pop out of their socket. Just like us, every dog has its own unique personality, but their general temperament is strongly influenced by their genetics and early life experiences. In choosing your dog, think about what breed or type of dog will best suit your lifestyle. Am I looking for a calm, quiet dog that settles easily, or a more playful, active dog? Is a small, medium or large-sized dog best for me? Do I have time to groom a dog that needs frequent brushing? Am I aware of the particular health and welfare problems some breeds can have? If you are interested in a particular breed of dog, be aware that different breeds are predisposed to different inherited disorders. Some dogs also have been bred for a particular ‘look’, resulting in exaggerated features that can lead to serious health problems. 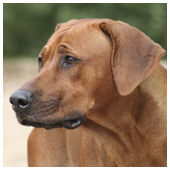 These conditions can cause dogs significant pain and suffering so be sure to find out about the problems that are known to occur in that specific breed or breed type. If you do choose to get your dog from a breeder, ask what action they take to prevent inherited disorders and avoid exaggerated features in their dogs. If you’re sure the type of dog you’re interested in will suit your lifestyle, and you understand any health risks, the next step is to think about where to get your dog! The RSPCA has many different types and breeds of puppies and dogs available for adoption with a large variety of personalities, sizes and colours. 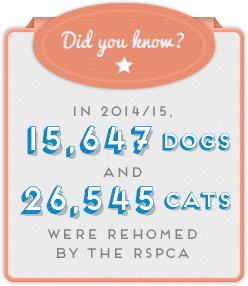 Regularly check with your local RSPCA and our adoption website at adoptapet.com.au. RSPCA dogs and puppies receive a veterinary health and behaviour check to ensure they are suitable for adoption as pets. They are also vaccinated, desexed and microchipped. One day a loving family decided that, since they had so much love to give, their family needed to become bigger. They visited the RSPCA website in search of a furry companion to share their lives and home with. Then they saw Dexter and it was love at first sight. They made the trip to RSPCA Burwood East in Victoria to meet the handsome pooch, and the love was confirmed. 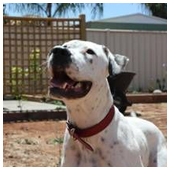 Still a puppy at heart, Dexter is very affectionate and a purveyor of good times. Having made himself right at home with his new family he enjoys pats, walking, eating, pats, soft toys, pats, cuddles, and did we mention pats? Dexter adores company and shows an unwavering loyalty to his new family. He is always by their side and always ready to go on adventures with them. Your very own ‘Dexter’ might be waiting for you at an RSPCA centre right now, so why not visit Australia’s most successful rehoming organisation to find your new best friend. Did the breeder plan ahead for this litter ensuring there were enough good homes for all the puppies? Does the breeder let you visit the breeding place and meet the mother dog (and father too, if he’s around)? Are you impressed with the standard of care and living conditions for all the dogs? Is the breeder genuinely concerned about the welfare of their dogs, open to questions and able to provide a complete history of the puppy? Have the puppies been health checked by a veterinarian, vaccinated, microchipped, and treated for internal and external parasites like intestinal worms and fleas? Does the breeder make sure that you and the puppy will suit each other? Do they ask you questions to make sure you will be a responsible owner? Is your puppy bred to be a healthy pet, with a suitable temperament and free from known inherited disorders? Does the breeder offer to provide on-going support and information after purchase and do they provide a guarantee? A good breeder will offer to take back unwanted animals within a specific time period after sale, or at any point in the future if the animal has problems arising from an inherited disorder. Does the breeder talk to you about desexing, training, socialisation and local government registration requirements? Does the breeder provide references to back up what they have told you? Is the breeder meeting all legal requirements? Legal requirements vary from state to state so contact the local council in the breeder’s area and ask whether breeders have to be registered with them and if there is a code of practice or guidelines they should be following. Take this handy pamphlet with you when you go looking for a dog so you have these questions at hand. Puppy farming is a major animal welfare issue in Australia. The RSPCA has been involved in rescuing thousands of dogs from puppy farms across Australia. A puppy farm (also known as a puppy factory or puppy mill) is an intensive dog breeding facility that is operated under conditions that fail to meet the needs of a dog, and is usually a large-scale commercial operation. However, inadequate conditions may also exist in small volume breeding establishments which may or may not be run for profit. Puppies and breeding animals on puppy farms live in appalling conditions. Dogs are often kept in overcrowded and filthy environments. Breeding animals may be confined permanently in small cages, never being allowed out for a walk, to go to the toilet in a separate space, play or express normal behaviours. Dogs from puppy farms often suffer from a range of health problems and may have behavioural problems as a direct result of the poor housing conditions they are kept in and the lack of basic care. Some of these medical and behavioural problems aren’t apparent until later in a dog’s life but can have devastating consequences for the dog and its owners. It can also be very expensive trying to treat or manage these problems.A puppy farmer may sell dogs in any way they can – online via a website, through pet shops, newspaper ads, car boot sales, local markets, or any other way. Sometimes they use a different house as a shop front, so you don’t see the poor conditions in which they breed the dogs. Checking the breeder provides a high standard of care and living conditions for all of their dogs. When you’re looking for a new dog or puppy, visit your local RSPCA or other reputable animal welfare or rescue organisation first. At any time, the RSPCA has many different types and breeds of puppies and dogs, with a variety of colours and personalities, all available for adoption and looking for a good home. If your local RSPCA or our national adoption website adoptapet.com.au don’t have what you are looking for on your first visit, keep checking - the right puppy or dog for you is likely to turn up soon. If you can’t find the right dog or puppy for you there over time, then the next step is to find a good breeder. Regardless of how you find a breeder, (the internet, word of mouth, in a newspaper or magazine ad or any other way) it’s very important to ensure the puppy has not come from a puppy farm. Visited the place where the puppy was born? Met the mother dog (and father dog too, if he’s there) and checked they’re happy and healthy? 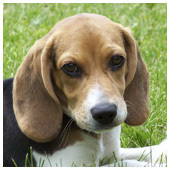 Ensured the breeder provides a high standard of care and living conditions for all of their dogs? All dogs need a clean, comfortable, safe and secure home. If your dog will be spending most of its time indoors, they will need a comfortable place to sleep. If your dog will be left on its own at times, start training it to be comfortable alone early on. Gradually increase the amount of time it is left and combine this with daily exercise, things to do and toys to play with (e.g., toys filled with dog food treats, a sandpit, and other safe dog toys to entertain them while you’re out). If your dog is going to spend most of its time outdoors it’s important to ensure there is plenty of space between eating, sleeping and toileting areas. Ensure your backyard is escape-proof with sheltered areas to protect from weather extremes like heat, rain and wind. But remember, a back yard - regardless of its size or how many toys you provide - is no substitute for regular walks and exercise outside of the home. It’s also important to ensure the inside of your home is safe for your dog by removing or covering any hazards like electrical cords and toxic chemicals. There may be times when you will need to board your dog temporarily while you are away. It’s great if you can find a friend or family member who can take care of your dog in your own home, or in their home if it’s safe and suitable. If you need to find a good boarding facility it's important to visit the site in person to check you’re happy with the conditions. See How can I find a good boarding facility for my pet? Dogs need daily exercise to maintain their physical and mental health. Plus it’s a great way for owners to get some exercise too! Walking on leash, or off-leash in designated areas, is a great way to help ensure your dog stays happy and healthy. However, you must ensure you have effective voice control of your dog, especially when exercising them off-leash, and even in a designated area like a dog park. Playing with your dog each day is another great way to provide them with attention, exercise and mental stimulation. Training and socialising your dog (that is, introducing it to other dogs and people) is essential to ensure your puppy or dog has the skills it will need throughout their life. The RSPCA supports reward-based positive reinforcement training and puppy and dog schools that utilise this type of training. You can contact your local RSPCA for advice on finding a training school. The first 3-17 weeks of a puppy’s life are critical for its social and behavioural development. During this time it is very important to provide it with positive experiences with a variety of people, places, sights and sounds. 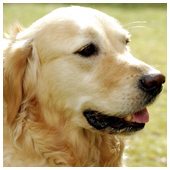 Experiences during this period can influence a dog’s behaviour throughout its life. The RSPCA highly recommends enrolling your puppy in puppy school classes (or dog in dog school if they need training) (contact your local RSPCA or vet clinic for more information on classes). Young puppies can be especially vulnerable to disease and infections, so it is important to ensure your puppy has the right vaccinations before introducing them to certain places (like the dog park) and unknown dogs. Your vet will be able to guide you on where and when it is safe to take your puppy to different places, so you can balance the need to socialise your puppy with protecting its health. Make sure all of your puppy’s four-legged play mates are friendly, healthy and up-to-date with their vaccinations too. See: How can I toilet train my puppy/dog? The RSPCA recommends reward-based positive reinforcement training as it is the most humane and effective way to train dogs, is enjoyable for the dog, and positively enhances the relationship bond between you and your dog. This training method sets the dog up to succeed and then rewards them for performing the ‘good’ behaviour (positive reinforcement). Rewards can be in the form of a dog food treat, favourite toy, a nice pat, or verbal praise in a pleasant tone of voice, “good dog”. By rewarding ‘good’ behaviour, you reinforce it and this helps make it very likely the dog will do it again, to earn more praise (or another treat!). Reward-based training does not involve punishment, force, or the assertion of dominance over the dog. Imagine a dog that jumps up to greet people –that may be OK for the owners but rather intimidating when they’re out in public or if there are visitors in their home. The owners have tried pushing the dog down and kneeing her to knock her off balance when she jumps. This has not worked, the dog seems to think it’s a game and in fact, she now jumps from further away to avoid the knee. The RSPCA does not recommend this kind of training and encourages dog owners to adopt reward-based training as a much more successful and humane technique. Firstly the dog should be completely ignored if she jumps – don’t speak to her, don’t touch her and don’t make eye contact. She should only receive attention (including eye contact) when she has four paws on the ground. The moment four paws hit the ground – she should be rewarded. The dog will most likely jump again with a little less effort – and again reward her as soon as those four paws hit the floor. Soon the dog will discover that it is not the jumping up that is being rewarded with attention, it is the ‘four paws on the ground’, and she will start to volunteer the behaviour that the owners want - four paws on the ground. Only when she is standing or sitting should she be rewarded with attention and treats. Dr Katrina Warren's training tips to help anxious dogs. Dr Katrina Warren's training tips to help avoid unwanted behaviour. Dr Katrina Warren's training tips to help your adopted dog settle in. Providing veterinary care when needed is an essential part of being a responsible dog owner. Your vet can advise you on annual health checks, vaccination schedules, microchipping, registration, preventative health care (external and internal parasite prevention), behaviour and desexing. Desexing is important to prevent unwanted/unplanned pregnancies and to reduce the number of unwanted animals in the community. Desexed animals are better protected from certain diseases and they are less inclined to roam and therefore less likely to get lost or be injured in an accident (e.g. hit by a car). Research shows that desexed animals actually live longer. Talk to your vet for more advice. First and foremost, talk to your vet for dietary advice. Dogs should be fed a high-quality, nutritionally balanced commercial dog food that’s appropriate for their life stage (puppy, adult) and health status. Check products comply with the Australian Standard: Manufacturing and Marketing Pet Food AS 5812:2011. Dogs may also be offered raw meaty bones occasionally to provide some variety and to help keep teeth and gums healthy. Bones must always be raw and human-grade. Safety note: Some fresh pet meat or pet roll products contain sulphite preservatives which can lead to thiamine deficiency in dogs and cats, which can be fatal. For that reason, the RSPCA advises that any raw meat or raw meaty bones offered must be human-grade quality as these generally do not contain sulphites (note however that sausages, sausage meat and cooked manufactured meats may contain sulphites). Ensure that your dog always has an adequate supply of fresh, clean drinking water as well. Many dogs need regular grooming, particularly long-haired dogs. In order to make grooming an enjoyable bonding experience that forms part of your dog’s routine, it’s best to establish this habit early in your dog's life. 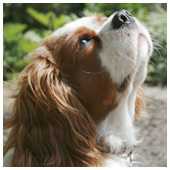 Associate grooming with a positive experience by rewarding calm behaviour with tasty dog food treats. If you wash your own dog, be sure to use products specifically designed for dogs. 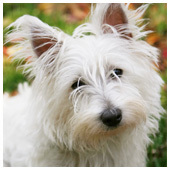 Some types of dog may need regular hair clipping and professional grooming to manage their coat. Talk to your vet for advice. Introducing your new puppy or dog to your home, friends and family is a fun and exciting time. Before you bring your new pet home, be sure to read up on how to provide the best care for your new four-legged friend. Do I have a clean, comfortable, safe and secure home for my dog? Do I have food, bedding, dog toys and walking equipment ready? Have I organised where I will take my dog for training and to learn how to make friends? Have I located a veterinary clinic? Do I know about desexing, microchipping and registration requirements, vaccinations and preventative health care (such as worming, flea and tick prevention)? This is the start of a happy friendship for both of you, so with the right research you can look forward to years of companionship together. Be sure to download our printable Smart Puppy and Dog Buyer's Checklist and take it with you when go looking for your new puppy or dog. If you'd like more information on caring for your dog, please check out our online Knowledgebase.